Central Coast United are proud to welcome late signing Jack Ragen to the club for the 2018 season! Beginning his footballing career as a Terrigal junior, Jack then entered into the Central Coast Lightning program. He stayed in this program as it transitioned into the Central Coast Mariners academy and played for them right through to 20s and 1st grade. 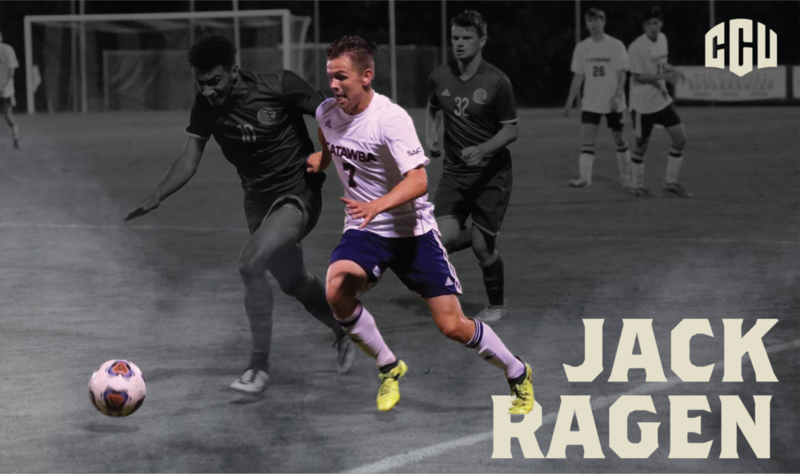 Seeking a change and a challenge, Jack then moved to North Carolina in the United States in August 2016 to play for Catawba College. Jack is now back in his hometown on the Central Coast and ready to join Central Coast United in their quest for the championship. 1st Grade Head Coach Stu Davis said of the signing, "He's another great addition to our Central Coast seniors set up. When I was the CCM U18s coach back in 2013, Jack was my captain and an integral part of the team, as I'm sure he will be for this club going forward as well. Jack knows the boys have done extremely well so far and has accepted the challenge to fight for a spot in the team. He knows our goal is to get this club promoted and is happy to help wherever he can." Central Coast United are exciting to announce our newest signing to the club, Tom Lyons. Tom began is footballing career at the age of 5 for the Kincumber Roos. It is here that he played all of his junior football until becoming a part of the Central Coast Lightning squad at the age of 11. After a period at Lightning, Lyons then moved south to play for Parramatta, before returning to the Central Coast at the age of 15 to play for the new Coast representative side, the Central Coast Mariners Academy. He was a part of the Academy teams up until the age of 18, before playing for the Central Coast Mariners Youth side the past couple of seasons. Lyon's joins CCU from the Northern Tigers, and is looking forward to training and playing with the squad. Upon signing Tom Lyons, General Manager Matthew Crowell has said, "Tom is another perfect fit for Central Coast United. He's a young, strong, athletic footballer and has played all of his junior football on the coast. He knows the majority of our current squad and most importantly, is a great young man. Tom has experience playing at the highest level for the Mariners, and will help Stu Davis with much needed numbers in his first grade squad. Going into the second half of the season, Lyons will help the club continue to move forward with the drive for promotion." Alex Arbelo you're back for 2019, tell us why you wanted to stay? I love playing for this club and I am a big fan it. Also I want to get CCU promoted! How did you think the team did this season? Very well considering it was our first season, just unlucky at the end of the season. Personally, how did you think you did this season? Me personally I had a good season, I reached goals I set but also fell short on other goals too like getting promoted. So there is a lot to improve still. What were your emotions like in that last game of the regular season against Prospect United? It was very tough pill to swallow after that game! I was very disappointed in that game. Could you tell us what you do in the club? Keep all the first graders happy with my great attitude and awesome banter! I am their punching bag all the time. I have two: One from the first trial game for the club against Bankstown, and my other favourite would be my 3rd goal during the Central Coast Stadium game! I’m sure all the boys will say Daniel McFarlane but I don’t have favourites! They are all great blokes and players. Best trainer at the club? Players to look out for in the future? There’s lots of good talent coming through the club and I got to see even more when we played against the Mariners, but right now it is Noah and Caleb from the 18s. To get promoted as a club, win the competition and win the final! Central Coast United would like to formally announce the signing of Cade Mapu. Cade began his footballing career at the young age of 6 at Ourimbah FC. It is here, at Ourimbah, that he played and developed as a footballer, and at the age of 12 was accepted into the Central Coast Mariners Academy. Since his acceptance into the Academy, Mapu has been working his way through the grades and has spent the past couple of years in the Central Coast Mariners 1st grade and Youth teams. He has a number of games in the NPL 2 Competition under his belt, and will add another attacking force to the squad. 2018 is the season that sees Mapu move to Central Coast United, to play with a number of former team mates. On the signing Mapu, General Manager Matthew Crowell has said, "I have known Cade for nearly 5 years through my time in the CCMA set up and have always been a big admirer of him. By chance, I watched him play for Lambton in a preseason game and asked if he wanted to make the switch across to CCU. This is another reason why this team needed to happen, people like Cade shouldn't have to leave the Central Coast to play representative football and I was thrilled when he said yes to joining up with the rest of the squad. Cade will be an integral part of this football club moving forward. " This Saturday will see the Central Coast Untied 1st Grade squad play their first round in the State League competition against Balmain FC. Kick off is at 7pm at Pluim Park, so get down and support the Coast's newest representative squad in their inaugural season or follow our journey of Facebook and Instagram @centralcoastunited. Central Coast United are proud to welcome defender Tom Mallett to the club. After playing away from the coast for the last few seasons in search of representative football Tom has jumped at the chance to come back and play for his home region once again. After playing in the UK for the AFC Bournemouth junior ranks as an 11 year old, Mallett moved to the Central Coast and began playing for Central Coast Lightning. Representing the Coast from the age of 12 to 15, Tom then headed south to play for Parramatta at the age of 15. Mallett progressed through the ranks and made appearances for both Sydney United and the Central Coast Mariners Academy between the ages of 17 and 19. Tom most recently moved back to Parramatta FC where he spent the last two and half seasons. Mallett's versatility will bolster the Central Coast United squad. Head Coach Stu Davis said, "I remember Tommy from my time as the CCMA U18s coach in 2013, he was playing for the 20s and every weekend I kept asking if I could have him for the 18s and the answer was always a firm no. As soon as I heard he was interested in being part of CCU I made the club fully aware of how much of an asset he would be for us. He's been great since he's joined the team and the way the squad is shaping up we are looking forward to an exciting season ahead." Cade Mapu is Back for 2019! Cade Mapu you're back for 2019, tell us why you wanted to stay? I love what Central Coast United is about. A great bunch of boys in the team and we got so close to promotion last season so hopefully next season we can accomplish that. I believe we can and it would be awesome to be a part of that and can’t wait to see how far this club can go. I think the team did really well in our first year and sets a good foundation to build on for next season. Personally how did you think you did this season? I thought the second half of my season was good but still lots of room for improvement. The last game against Prospect was pretty devastating. It was pretty hard for all the boys but we put that past us and went on to win final. My own favourite goal or any favourite goal? My own would be scoring first in the grand final I guess, but if it’s any goal it would be McFarlane’s free kick against UNSW in the first round. Swaddo alway goes good at training. Noah and Cayleb debuted in 1st Grade this season and they’ve both had great seasons. Goals for next season would be to win the club championship, get promoted and score more goals. Central Coast United are excited to announce the latest signing for our club, Ian McAndrew. McAndrew began his footballing career as a 7 year old for Wyoming FC. Between the ages of 11 and 16, he played for the 'Central Coast Lakers' and the 'Coasties', before once again joining his childhood club Wyoming and playing All Age 4s in 2005. 2006 saw McAndrew make his debut for Wyoming first grade, before heading to the Central Coast Mariners at the age of 18 for the 2007-08 season. After a short stint with the Mariners, McAndrew headed to Sydney to join the Mounties Wanderers FC for a season. In 2010, 4 years after leaving Wyoming, Ian once again returned to play for the Wyoming first grade side. This year proved to be a highlight for McAndrew, as it saw him selected for the Futsalroos Asian Cup squad, where he played alongside the likes of Tom Rogic, who now plays for Celtic FC. After this McAndrew headed to Gosford City FC, where he has been playing in the Premier League for the past 5 years. McAndrew will bring an air of experience to this young squad. Techincal Director Dean Heffernan said " I have known Ian since our time together at CCM and I've always thought that he had potential to play at a high level. I watched him play recently in the BPL Grand Final and even though Gosford lost that night Ian was still very impressive when he had the ball. Ian knows the areas that he needs to improve on and his application in pre season has been very pleasing. A fit, strong Ian McAndrew is a huge asset for Central Coast United not only in the up coming season but in the seasons ahead"
Further player signings for Central Coast United will be released over the coming days and weeks. You can follow our journey into the 2018 season on Facebook and Instagram, @centralcoastunited. Central Coast United are proud to announce the signing of Scott McGinley. McGinley began his football career at the young age of 5, for Killarney District Soccer Club. Playing here for the larger part of 5 years, he then made his move to the Central Coast "Coasties", where he began his representative football. Moving away from the Coast, McGinley joined Northern Spirit, before heading to Scotland for a year. Scott's time in the UK saw him trial with Motherwell, Hamilton, and QPR. At the age of 19, upon his return to Australia and the Coast, McGinley became apart of the Central Coast Lightning squad. This then led him to play in the Mariners Youth League team at age 21. McGinley has spent the last 5 years playing for Newcastle side Valentine Phoenix FC. Scott is extremely excited to be back representing his home region and will give the team added options through the midfield. Head Coach Stu Davis has said, "Scott is someone I wanted from the very beginning. He brings a wealth of experience which will only help our younger players get better. He is a top, top player and with the players who we have already signed I cannot wait for the season to begin." Central Coast United are proud to announce the latest signing to our club, Alex Arbelo. Arbelo began his footballing career on the Central Coast as a Terrigal junior. In a quest for tougher competition, Alex moved south and played for some of Sydney's most notable clubs, including Gladesville Hornsby, Blacktown City and Bankstown City. Arbelo's hard work paid off and saw him head to Uruguay to play for the Montevideo Wanderers. Following this overseas stint, Alex returned to Sydney and continued his footballing career, playing first grade for Hills Brumbies and Marconi FC. Arbelo is a welcomed attacking force for CCU, and we are excited to see him return to the Central Coast to play football. It is signings like Arbelo that embody the central philosophy of Central Coast United- that no player should have to leave the region just to play representative football. Central Coast United are proud to announce our latest signing for the 2018 season, Nathan Blunden. Blunder began his junior football career at The Entrance FC at the age of 5. He then moved to play with Tuggerah FC until he was 15, before joining Central Coast 'Lightning' representative program. At the age of 18, Nathan was drawn back to his childhood club, The Entrance, where he has since been playing in their first and second grade squads. The signing of Blunden embodies what this football club is all about. To play in front of friends and family for your region is special, but to also play alongside younger brother Adam is even more special. This partnership will surely provide a unique force for the team, and only make the squad stronger as a whole. Central Coast United are pleased to welcome former Mariners NYL defender and Budgewoi FC junior, Jordon Bennett to the club. A utility player, Bennett joins CCUTD, after receiving NPL Men’s Player of the Year honours which saw him selected in the Mariners Foxtel National Youth League squad. The Central Coast local joined the Mariners from the New South Wales Institute of Sport program in 2014. Despite being played mainly on the right side of defence, Bennett is considered a utility who can play a number of defensive roles. 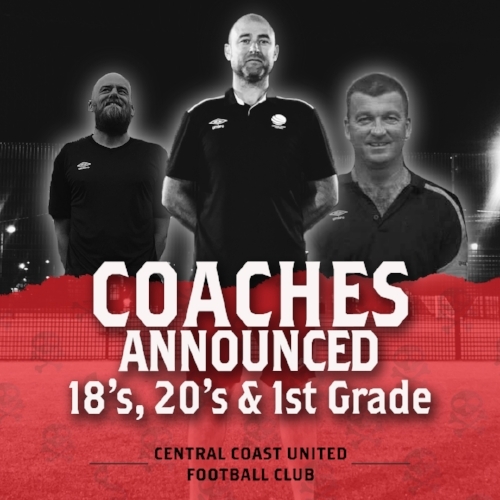 Central Coast United have announced Stu Davis as the clubs head coach for the 2018 State League competition, working with Ash Grant (20's) and Alex Powell (18's) in the senior program. Working under the guidance of Technical Director Dean Heffernan, the club has continued its promotion of local talent - with the three coaches all from the Central Coast. Davis has extensive coaching experience at Local level with Berkeley Vale's Mens Premier League side, as well Central Coast representative U18's. Most recently he lead the CCFA under 16's to an undefeated season in the 2017 AYL competition, where he will be looking to bring through those players into the State League program. Popular Local coach Ash Grant will take the Under 20's team leaving his post as Terrigal FC's Premier League Coach and head of football. Grant has experience coaching with NPL Sap programs and with the Northern Tigers football club. 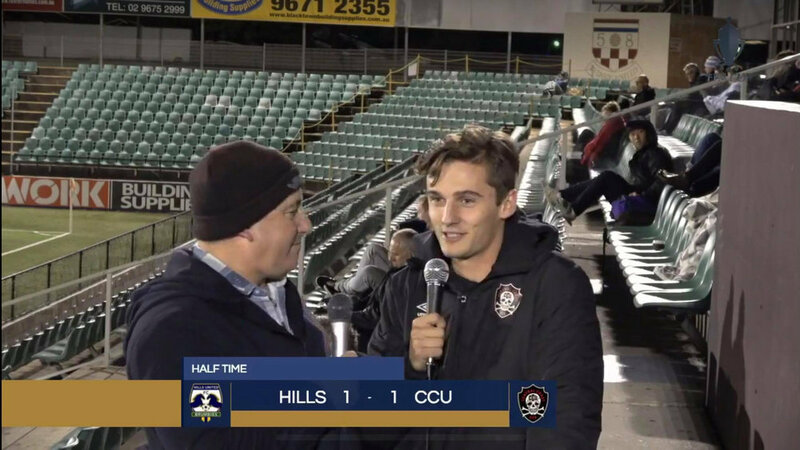 Looking after the U18's team is Alex Powell who is degree qualified in Coaching with experience at all levels of the local game, most notably at Ourimbah United FC. Dean Heffernan has officially been appointed at the Central Coast United's first ever technical Director. Dean will be overseeing the full Central Coast United Program from Under 9's, through the AYL and including the State league senior teams. The former Socceroo has just completed his FFA A-License course, Heff also brings extensive playing experience from the English Championship and A-League. Adam Woodbine has signed with the Red and Black of Central Coast United, providing further attacking options for head coach Stu Davis to utilise in 2018. The striker has joined from Gosford City FC, where he found the back of the net 13 times last season - accounting for 35% of the teams goals! ''I am excited to link back up with my fearless leader Geordie Howe, and play for the Central Coast again" Woodbine commented. A proven representative player for the Central Coast, Woodbine has also featured for the Entrance and Gosford's Battlewin Premier League sides in the last few years. Central Coast United have announced their third player signing for the 2018 season, with versatile young defender Adam Blunden joining the club from The Entrance Bateau Bay FC. Coming from a 6-year stint with Central Coast representative teams as a junior (2009-2014), Blunden then went on to win the 2015 CCF Men’s Premier League First Grade Grand Final in his first season of club football. 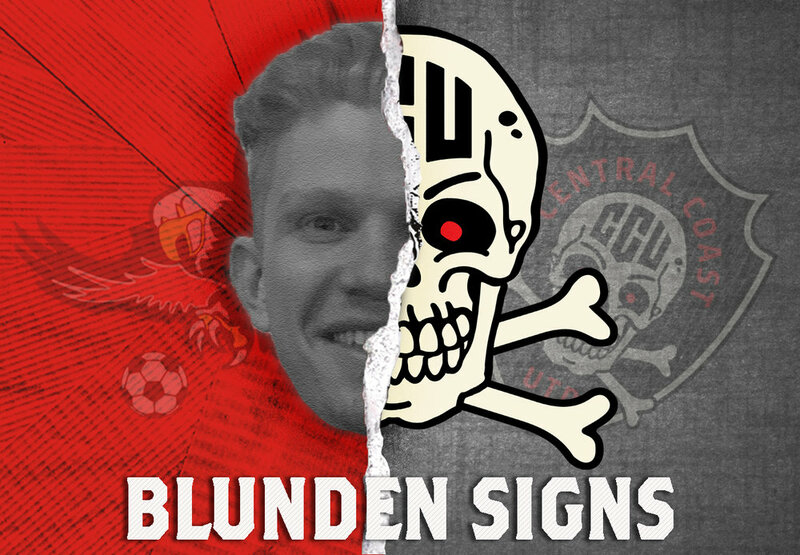 “I am thrilled to be joining the Red and Black of United” said Blunden, who also played in the 2017 CCF All Stars Match. “The ability to play at a higher level, whilst still representing the Central Coast was appealing to me – and I hope to have an impact on our inaugural season”. When asked about the Clubs Logo and Colours, Blunden was clearly excited – “Coming from ‘The Reddies’ at the Entrance, I absolutely love the Red and Black of my new club, and the logo looks incredible’. Central Coast United FC are proud to announce the first 2 player signings for our inaugural State League team in 2018 FNSW competition, Geordie Howe and Daniel McFarlane. Both players represent the Central Coast Region with extensive careers at local club and representative level and form the beginnings of the CCUTD leadership group. Howe (25) joins Central Coast United from Gosford City FC where he has played in three consecutive Men's Premier League grand finals. An established junior career with Central Coast 'Coasties' and Central Coast 'Lightning' representative program from 2003 – 2011 before a season stint at Valentine FC, the versatile defender recently lead the Central Coast Football All Star Select team against the Central Coast Mariners and is searching for the elusive premiership. McFarlane (19) is another local junior, with experience in the Mariners National Youth League team for several seasons and most recently playing for the Mariners Academy First grade side. McFarlane has significant overseas experience, earning trials in the UK with Swansea City and Birmingham City as a 15 year old and playing first team football for the Cumbernauld Colts FC in the Scottish Lowland Football League. Trials for State League Under 18's, 20's and First Grade start on Tuesday 24th October at Pluim Park Click below for more info & to register.